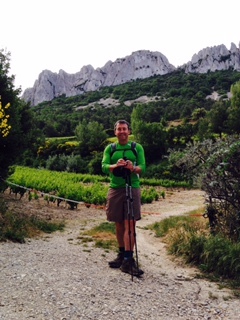 Nick O'Connell of The Writer's Workshop hiking in Provence's Dentelles de Montmirail. tories matter. At a time when social media has become ubiquitous—the oversharing on Facebook, the relentless churn on Twitter, the blur of perfect moments on Instagram—it’s a relief to return to story. Story is one of the oldest and surest ways of making sense of our lives. It’s an activity buried deep within our DNA that we can return to again and again to enrich our sense of self and culture. Stories heal. Stories amuse. Stories entertain. Stories teach, but not in a didactic way. They do so by example, exploring the nuance, contradiction, and mystery of our lives and world. Readers of The Writer’s Workshop Review may recognize the circling of certain themes from past issues, but we nevertheless continue to publish a wide range of stories on a wide range of topics. We never know exactly what we’ll like until we see it, which is certainly true of our 13th issue, with its rich and varied collection of new stories: “You’re All Wankers,” an excerpt from Jeff Smoot’s entertaining memoir, Hangdog Days, celebrating the early history of sport climbing; Jessie F. Carr’s, “A Pattern of Deep Wells,” a nourishing account of her family’s multigenerational obsession with waffles; Tamara Adelman’s “Trophy Girl,” an exploration of the addictive qualities of competitive tennis; The Writer’s Workshop student Kelli Bynum’s haunting memoir excerpt, “There’s Been An Accident,” about a tragic cycling accident; Carol Newman’s “The Queen of Fairbanks,” a roller coaster ride about rafting Alaska’s Nenana River, and finally an excerpt from my book, Crush: An Apprenticeship in the Crazy, Wild World of the Wine Trade, where I get my hands dirty and sticky picking some of Napa’s finest grapes at Cain Vineyard. I'd like to thank the following people for their help with this issue: all the writers who contributed, Managing Editor Kathleen Glassburn for keeping things on track, and Irene Wanner for careful reading and editing of manuscripts. We’re looking for an additional reader, so please let us know if you’re interested. It’s a great opportunity to learn about the world of contemporary literature. We hope you enjoy the 13th issue of The Writer's Workshop Review. Please let us know what you think, and if you have a story that might work for us, please send it. We read all year and welcome submissions at any time. We look forward to hearing from you! RAVEL WRITING CLASS IN PROVENCE (June 2-8) – Travel writing, Food writing and Wine writing are some of the most appealing genres of nonfiction, calling on all of an author’s skills—dramatic scenes, character sketches, concrete detail, point of view, scene by scene construction—to compose compelling, engaging travel narratives. This six-day intensive class will introduce you to essential techniques of travel, food and wine writing and give you expert, insider advice about how to submit and publish finished travel stories. In addition to learning these skills, you’ll dine at outstanding restaurants, visit some of the world’s best wineries, and explore fascinating historic sights during the travel writing classes. You’ll enjoy exclusive behind-the-scenes tours unavailable to the general public. Best of all, you’ll receive up-to-date story ideas from local industry experts that you can turn into finished travel, food and wine stories by the end of the class and submit to newspapers and magazines for publication. And now, I will personally edit and recommend your stories to a well-known food and beverage magazine for likely publication. 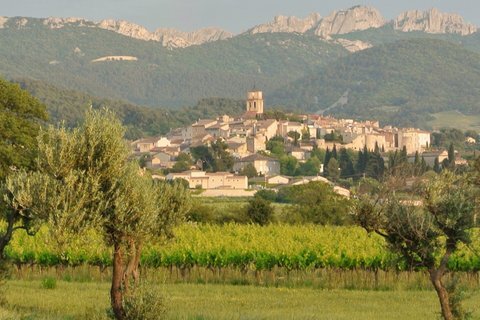 The one week travel writing class will take place in Vaison la Romaine, one of the most beautiful medieval hill towns in Provence, and a center of the region's cultural and epicurean life since Roman times. The cost will be $2,600 per person, including accommodations and most meals. (single supplement, $500 per person). Plane fare, transit to and from Vaison la Romaine and some meals extra (see itinerary below). To enroll, please send me a non-refundable deposit of $800 to 201 Newell St., Seattle, WA 98109 or you can pay with a credit card via the Paypal link of my website. The balance for the class will be due April 1st. After that date, there will be no refunds except in the case of medical emergency. Enrollment is limited to 10. For more information, contact me at nick@thewritersworkshop.net, 206-284-7121, or take a look at my website: http://www.thewritersworkshop.net/travel.htm.